And a physician-executive shall lead them. 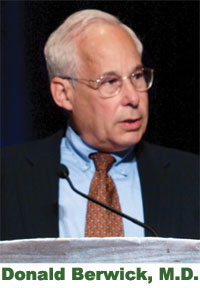 Donald Berwick, M.D., the soft-spoken patient-safety advocate prone to broad campaigns to try to help save lives, is set to be sworn in as the new administrator of the CMS on July 12. Berwick has been at the center of a firestorm since March, when President Barack Obama recruited him to become a crucial cog in the massive health reform machine. As CMS administrator, Berwick faces the dual tasks of overseeing the $700 billion a year agency while enacting the scores of changes to the Medicare and Medicaid programs included in the health reform law. His nomination to the post drew criticism from many in the GOP, who say that Berwick's past support for the U.K.'s government-run healthcare system, coupled with his writings that they say indicates he supports rationing of healthcare, disqualified him for the job. Political observers say Republican lawmakers view the nomination of Berwick—a founder, president and CEO of the Institute for Healthcare Improvement, a Cambridge, Mass.-based not-for-profit—as an opportunity to continue debate on the health reform plan passed in March. Last week, that move came to a head. Deciding to sidestep what would have been a lengthy and contentious confirmation process on Capitol Hill, Obama used what's known as a recess appointment to install Berwick to the top post at the all-important agency that runs Medicare and Medicaid. The use of such an appointment, granted to the president under the Constitution, has grown in popularity dating back to President Bill Clinton in the 1990s. “It's unfortunate that at a time when our nation is facing enormous challenges, many in Congress have decided to delay critical nominations for political purposes,” Obama said in a written explanation of why he decided to skirt Congress. Other GOP senators sounded a similar note. “This recess appointment proves the Obama administration did not have the support of a majority of Democrats and Republicans in the Senate and sought to evade a hearing,” adds Sen. Pat Roberts (R-Kan.), who as a member of the Senate Finance Committee would have helped to decide Berwick's fate. At the outset, Berwick will face a litany of tasks focused on making wholesale changes to how the federal government pays for healthcare. And Berwick's appointment was hailed in a flurry of support from other healthcare industry representatives and consumer groups. The provider world cheered the idea that for the first time since 2006, the CMS would have a permanent administrator rather than a series of interim candidates. Though far from a revolving door, the agency has been without a full-timer at the helm since Mark McClellan, M.D., left the job four years ago. The difference between having a confirmed administrator over a series of interim ones is subtle, and to be sure the agency has progressed under a number of temporary directors, says Chip Kahn, president of the Federation of American Hospitals. Hospital and health system executives say Berwick's advocacy for healthcare quality and efficiency has earned him the respect of providers, and he brings valuable experience to the CMS as the agency implements provisions of the health reform law. “He has been an engine of healthcare reform before we were anywhere close to achieving healthcare reform legislatively,” says Alan Aviles, president and CEO of the New York City Health and Hospitals Corp. Aviles says hospitals, under initiatives led by Berwick and the IHI, have improved the safety, effectiveness and efficiency of care while reducing wasteful spending. “He is the ideal choice for helping CMS to most strategically advance a set of pilots and demonstrations that will inform the course of broader payment reform,” Aviles says. James Kaskie, president and CEO of Kaleida Health, Buffalo, N.Y., describes Berwick as “a pioneer in advancing quality as the most important driver of the healthcare system,” and says he was excited and hopeful on the physician's appointment to head the CMS. Kaskie also says he is glad to see the CMS fill the vacancy at the top. Interim leaders lack authority to make changes or set an agenda, he says. Elliot Sussman, M.D., president and CEO of Lehigh Valley Health Network, Allentown, Pa., says patients, nurses, doctors and administrators identify with Berwick's emphasis on measuring quality, safety and value and his focus on patients. “I think people care” that healthcare is centered on patients, he says. “That means a lot. You take into account who I am, what I believe, what's important to me,” he says. Physician groups also back the appointment. “Dr. Berwick's career and work at the Institute for Healthcare Improvement illustrates the drive to provide patient-centered care, patient safety, quality improvement and care coordination in healthcare,” says J. Fred Ralston Jr., M.D., president of the American College of Physicians, in a written statement. “He is well-respected in the healthcare community and known for his desire to bring constructive change to healthcare delivery. We share these objectives and believe Dr. Berwick will be an able administrator and partner for change,” Ralston says. Consumers Union supports Berwick as CMS administrator. “We are relieved that President Obama moved ahead on this appointment,” says Jim Guest, president and CEO of Consumers Union, in a written statement. “Don is a healthcare leader of extraordinary skill, knowledge and compassion. He's the right person for the job at this critical moment. He will make a fundamental difference in improving the way the system works for Medicare and Medicaid beneficiaries, and everyone,” he says.